Living in China definitely teaches you a lot. If it is your first time visiting the country, you may be in for a bit of a shock. I absolutely experienced culture shock when I first arrived, both good and bad. Overall I had the most amazing experience living in this vast and beautiful country. With that being said, it is not the easiest place and there is some getting used to. Here I will share with you 10 tips that can help you with your travels, including different Apps to use, how to get around, as well as clarify some false or exaggerated information I read before I went. If you are from a western country, even if you have traveled quite a bit, you still need to take in China with an open mind. The way of life and how they conduct themselves socially, and daily may come across very unusual, but don't be too quick to judge their character by your first impression. Places get very crowded and it can be overwhelming at first if you are not used to it. Standing in a neat line is not the norm, you must learn to stand your ground or people will cut in front of you. You may see people spitting on the side of the road and there is no laws against where you can smoke. Don’t let these first impressions turn you off from the kindness of the Chinese people and their eagerness to get to know you and help you in any way they can. I highly recommend spending a good amount of time in this country if possible, more than a week would be ideal if not longer. There is so much to see and varying differences from province to province, from the landscape to the cuisine, to the language. See some different cities, both big and small, if you have the time. There are amazing huge cities to wander as well as beautiful countrysides of varying landscapes. Experience some of both if you can. I lived in the city of Chengdu in the Sichuan Province of China. This is a large metropolitan city of 14 million people, which I highly recommend a visit. Despite the fact the city is big, you most likely will have a difficult time finding people that speak English, or that speak it well. Do not let this stop you from visiting, this was part of the fun of the country. I recommend downloading a good translation app, such as google translate. Not only can you translate by voice or typing in, but you can also take a photo of Chinese characters (which is all you may find at many local restaurants) to help you get by. China has amazing public transportation, both within the cities and between the cities. They have beautiful and clean high speed trains that can be a fun experience which also allows you to easily transfer to nearby places in a shorter time. They also have regular trains but I personally did not go on one, choose high speed if possible to get the most comfort and efficiency getting to your next destination. Always purchase your ticket a head of time and have it printed out before you go because the train stations can be a nightmare. It is very unclear what line to get in and when we had questions could not find anyone that could help us and almost missed our train. You can purchase tickets online with an APP I will share below or find a travel agency that can help you. You can purchase tickets at the station but again I do not recommend it, as they can get sold out and knowing what super long line to get into can be a guessing game. Taxis and hired cars that are equivalent to Uber, called Didi, are also a transportation option that you will find inexpensive. Uber itself has gone back and forth with functioning in China, however I highly recommend you download the APP Didi as it has less expensive fairs and, unlike when I first moved there, there is a full English option. The taxis can be good sometimes, just be aware that some may try to scam you. I found that most will not, but where you need to look out for those taxi drivers that might, is near major tourist’s spots. If they notice you are a foreigner they may try to take advantage. Regardless, you will find that both Didi and taxis are very affordable compared to these types of transportation in America and possibly other Western countries. We even ordered a Didi from Beijing to the Great Wall, which was about an hour drive for a super low price of maybe $15 USD each way. Most all major cities have a good metro (subway) system. It may take a bit of a learning curve to understand how it works, but once you get it, you will find it super easy to use and very inexpensive. You can pay by trip, just use a little kiosk and choose your destination stop. Another option is to buy a metro card that can be purchased at 7-11s or Metro stations. You add however much you want onto it and then just scan your card each time you enter and exit the metro station. You do have to scan your bag when entering the metro. You can have liquid but they must scan the liquid before you enter and make sure you do not have any aerosol products, they will make you throw them away or not allow you through. At the end of this article I also share an App with metro that works in many major cities across China. Local buses within the city are also super convenient and easy to use. Each bus comes frequently, they are nothing fancy but comfortable enough. Do be aware that both the buses and metro can get very very crowded during early morning and late afternoons during work commuting. The same card that you use for the metro system can also be scanned and used as you enter a bus. You can also pay the bus per ride. Cities in China have jumped on the grab and go bikes which I loved. This is a great way to get places and see different parts of the city or countryside you are visiting. Choose one of the bike APPS such as OFO or MoBike. Those are the major brands, but there are many more companies that have popped up you can choose to use as well, you just need to download the corresponding App and load money onto it. Depending on what city you are in I would research what mobile bike companies are the most popular. Ofo and Mobike have bikes literally everywhere. You add money onto your App then scan it on the bike to unlock it, take it then leave it wherever you end up and pick up a new one for your ride home. I loved getting around this way! Chinese food in China is nothing like what you get in Western countries, it is so much better and so different. Do not be afraid to try new things, including street food. Of course be cautious if you don’t feel it is being heated properly or has been sitting out for some time. I tried all kinds of food from places that did not look so clean and never had any issues. Sometimes there is a lot of oil used that can maybe be upsetting to the stomach and just like anywhere else food poisoning can happen. 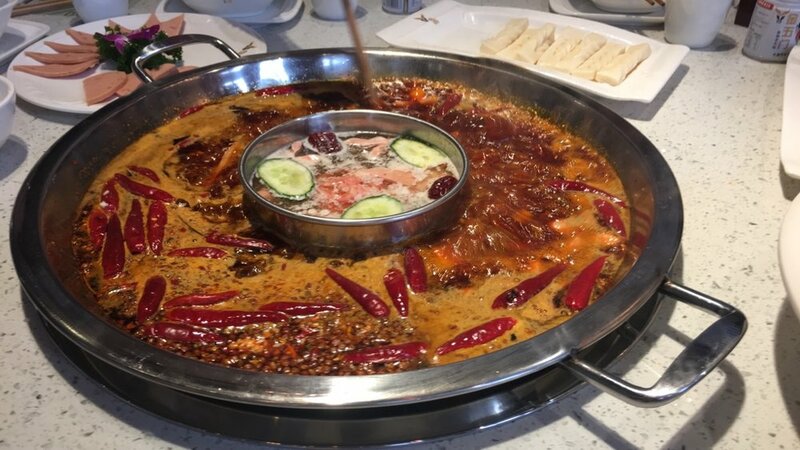 Don’t let it stop you from trying all the amazing cuisines that China has to offer like Sichuan Hot Pot, Peking Duck, Steamed Buns, Handmade dumplings, Biang Biang Noodles and so much more. When I say have an open mind, having an understanding that personal space is not something that the Chinese really care about, is one of those things. In line someone may stand right up next to you and you can feel their breath down your back or on public transportation you will be pressed up against everyone else with no room to even move. This is normal and not unusual to their everyday life. It may not be some thing you can’t necessarily get used to but having patience and not stressing yourself out is going to make your time more enjoyable. There is nothing better than experiencing a country through the eyes of a local. The Chinese are wonderful people and so willing to help. The language difference may be difficult to make new friends but if you come across people who do want to get to know you or show you around, do not turn it down. This is the best way to discover the best places, best food and learn more about the culture firsthand. I have made some of the most wonderful friends that I continue to be in touch with today. If you are planning to do any work while you are traveling in China or if you want access to your social media accounts, you will want to get a VPN for your laptop and/or phone. There are free Apps that you can download for your phone but they may or may not work. The government blocks certain websites such as Instagram, Facebook, Skype, WhatsApp and even Google. If you want to have access to these you need to have a VPN, which is a virtual private network. Basically you choose a location outside of China and it runs your IP address in that location instead so you are able to access those sites. If you want a VPN that is reliable I highly recommend Express VPN, it can be downloaded and used on both your computer & phone for one price. There is a cost but it is worth it if you want something that will for sure work for you and not be too slow. Regardless, be aware that even though China is such a large country and WIFI is widely available, it can be very slow at times even in a large city. There are some absolutely amazing things to see in China such as the Great Wall in Beijing, Terracota Warriers in Xi’an, the many incredible Buddhist Mountains, the karst mountains of Yangshuo & Guilin, and so on. Places such as this are absolutely worth going but I highly recommend also taking time to step outside of the famous sites and go see places not normally seen. This is where you will get a feel of the true China, the best food and really see what daily life can be like. Also, be aware of when you choose to go to any of these hotspots. You may have seen horror pictures, such as the Great Wall, filled to the brim with people. Don’t worry, this is not every day, but it is good to make sure that before you do go to highly visited tourist spots, that it is not a holiday (and there are many). This can drive very large amounts of traffic to those places and you could find yourself very frustrated waiting for hours or in claustrophobic crowds just to get a glimpse. I recommend seeing some of those places but leaving some days to just wander as well, or take a bus to a nearby town you know little about. Do not be afraid to get out and explore but just make sure you are prepared in knowing how to get back. Apps can become your best friend to help you get around and get through daily life in China. WeChat: If you are spending a good amount of time in China, I would download this App. They use it for everything, it’s there equivalent of Facebook + Apple Pay and everything else. This will be the best way to stay in contact if you make any friends there and it can also help you communicate with others back home. There were a few times that VPNs did not work at all, but WeChat you can always use. Have people back home that you really want to be sure to be in contact with download it too, before you go that way you can for sure always be in touch. You can also load money on here for the metro/bus, as well as using the bikes. You can also order food delivered right to you. Hello Chinese: This is a great APP to learn Chinese. Start practicing a little bit before you go, the Chinese people will be ecstatic if you know a little bit, even just to say where you’re from or to tell them your name. Simple phrases can make their day. Also, memorize “I don’t understand” (Wo ting bu dong) in Chinese as you will find yourself saying this phrase a lot to help avoid them continuing to talk at you. Learn other little phrases here or take it all the way to become fluent in Mandarin. GlobeConvert: This is a currency exchange APP. It will help you to understand the price you are paying in your local currency. Everything you see will be in RMB (also called Yuan). On that note it’s also a good idea to get cash. Some places will accept cards such as visa but if you go to small restaurants or markets they may not. Ctrip: This is a hotel/transportation booking APP or website and gives you the best prices within china. You can use it to book your stays, train travel and flights. It is easy to use as well. You can use either the App on your phone or go directly to the website http://www.ctrip.com. Taobao: this is even better than amazon. If you are just there for short term, you may not need this APP. For those going to China on longer trips or moving as an expat this is such a great resource. It is like the Chinese version of Amazon and you can literally get anything you want at such cheap prices. This one I did feel needed some help setting up the delivery by a local friend but if you are there for some time this is a great place to buy things. Explore Metro: this can help you navigate the local metro system and see what the different stops are. It works in several of the large cities, just double check that the city or cities you are visiting are available through this App first. Go to the below website and see if the city you are going to is on the list. Air Quality China: This is important, especially if you have any issues with asthma or other breathing issues. Most likely you can tell by looking outside how bad the smog is but it is good to have a look on the pollution on an App to decide if you should choose to wear a protective mask. It's a good idea to have some good quality ones handy. You and find them everywhere for cheap once you are there if needed. I truly hope you choose to include this beautiful country in your travels one day if you have not been already. Yes, it is very safe, but not always easy and a bit overwhelming to get around on your own. If you are prepared and give yourself time to learn, then it can become a lot easier.